Cut the Tenderloin in half lengthwise; place in a shallow dish and rub with 2 Tbsps. of the Sugar. Let stand for 15 minutes at room temperature. In a small bowl, combine the remaining Sugar and the rest of the Filling Ingredients to make the Marinade. Pour half the combined Marinade Ingredients over the Meat; be sure to cover all the pieces. Cover and refrigerate for several hours or overnight. Cook the Noodles as per the package directions; rinse with warm water to remove the starch and set aside. Wash and dry the Vegetables; remove the stems from the Mushrooms and discard. Remove the seeds from the Bell Peppers and then cut into julienne strips. Peel and slice the Onion into ¼” slices; peel and thinly slice the Carrots. Place about ¼ “of Water in the bottom of a shallow baking pan. Place a rack in the pan and place the Meat on it. Turn the oven to broil and adjust the top rack so that it is 4” below the broiler flame. Cook the Meat for 7 minutes or until it just starts to char; turn over with tongs and brush with the Marinade. Return to the broiler and cook again for 7 minutes more or just until the meat starts to char. While the Meat is cooling, combine the reserved Marinade with the remaining Marinade from the meat and place in a small saucepan. Cook on top of the stove over medium-high heat until it is reduced by about ¼. When the meat has cooled, sliced into ¼” slices. Add about 1 Tbsp. Peanut Oil to a wok and heat over high heat. 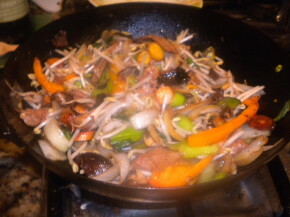 Add the sliced Carrots, Mushrooms and sliced Onions and stir fry for about 2 minutes or until slightly softened. Add the sliced Bell Peppers and stir fry for 1 more minute; remove the cooked vegetables and set aside in a covered dish. Add the sliced Meat to the wok along with a little of the water from the bottom of the baking pan; cook just until the meat loses most of its pink color. Transfer the Meat to the dish with the Vegetables. Place the cooked Noodles in the wok along with a little of the cooking water; once most of the water has evaporated add about 2-3 Tbsps. of the reduced Marinade to the Noodles. Transfer the Noodles to a serving platter; return the Meat and Vegetables to the wok with a small portion of the reduced Marinade and stir fry just until the contents are heated through. Place on top of the Noodles and garnish with the Green Onions and Cilantro. Serve immediately with Cucumber Salad or fresh fruit.